New Jersey Gov. Chris Christie is trying to connect with Iowa conservatives by assuring them that "you'll always know who I am" if he runs for president. Christie told the Republican voters in the leadoff primary state in the nomination battle that they shouldn't let his blunt style turn them off. To those not enamored with all aspects of his record, Christie asserted "you'll always know what I believe and you'll always know where I stand." He spoke at length about his anti-abortion views, which tends to resonate with Iowa's social conservative caucus-goers. Christie, Sen. Ted Cruz of Texas, Wisconsin Gov. Scott Walker and many others turned the Iowa Freedom Forum into the unofficial launch of the next campaign for the Iowa caucuses. More than 1,000 religious conservatives met at a refurbished theater to hear their pitches. The forum's sponsor, Rep. Steve King of Iowa, opened the event by asking the crowd, "Do you believe that the next president of the United States is going to be speaking to you today?" The audience erupted in applause and King responded, "As do I." Few would pick Christie, an abortion rights and gay marriage opponent better known for his union and budget battles, to emerge as the favorite among Iowa's evangelical voters. Yet his appearance could allow him to make inroads with a group focused as much on ideological purity as defeating the Democrat nominated to follow President Barack Obama. "He has gusto that makes him an everyman. 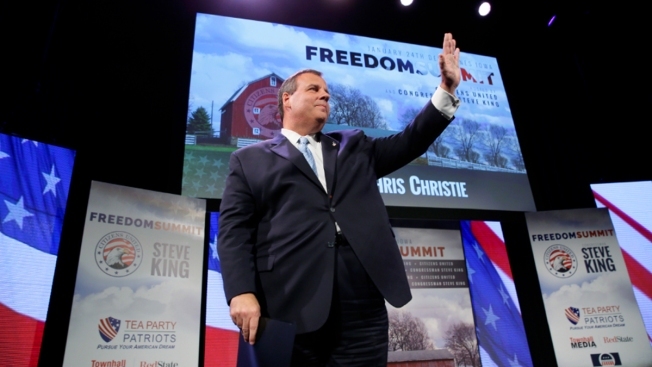 That appeals to me," 29-year-old Steve Friend of Sioux City said of Christie. "But I think he tanked the 2012 election by praising President Obama after (superstorm) Sandy." Christie has defended his praise of the president for visiting storm-ravaged New Jersey in the weeks before Romney lost. But it's an image that sticks in the craw of Iowa's most right-wing conservatives. "I don't trust him," said Mary Kay Hauser, another forum attendee. "I think he's disingenuous. I think he's part of the old New Jersey party."